Matted fur makes your tabby look shabby. Has your kitty's fur gotten matted and dirty? When your cat sheds fur from her coat, it can become tangled in the rest of the fur if not brushed away. This, along with sticky dirt, forms mats that not only are unattractive, but can cause your little one serious discomfort. Cats shed during spring and fall according to changes in the weather. Your cat sheds her thick winter coat in the spring, in preparation for the warmer spring and summer months. She then sheds this warm-weather coat in the fall, before she grows her thicker, winter one. If your kitty is kept primarily indoors, she'll shed year-round because the environment is temperature-controlled. Any hairs that your little one sheds wind up on the floor, or are ingested by her when she grooms, or become tangled with her coat and form mats. Dead hairs, combined with dirt or other debris from her environment, wind up forming hard, sticky mats. 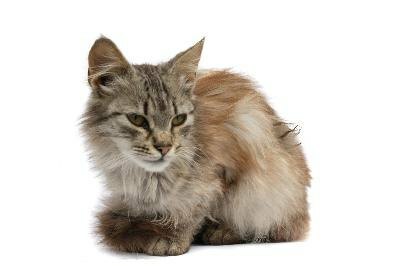 In longhair cats, clumping litter can also stick to her rear-end, forming smelly mats in her coat. Mats provide hotbeds for fleas, ticks and other skin parasites that can affect your cat, along with various types of infections. These tangles can even weigh down your cat in severe cases and prevent her from going to the bathroom if they form over her back end. Find mats on your kitty's coat by using a wide-tooth comb, and use a mat-breaker brush to gently cut through them, while holding the fur at the roots to prevent discomfort for your little one. You can also sprinkle cornstarch throughout the fur to help loosen the tangled fur, or use a spritz of leave-in conditioner. Although some of your kitty's mats can be removed with a mat-breaker or your fingers, others can't. These need to be trimmed away. Use an electric clipper to trim smaller mats that are close to the skin; this prevents you from accidentally clipping your furry friend's skin with a scissors. Serious cases of matting sometimes require the help of a groomer or veterinarian. A cat covered in mats might even have to be put under anesthesia and shaved, to prevent discomfort and pain during the hair removal. Have your vet examine your kitty for any skin inflammation or irritation after the removal of serious mats. The best way to prevent mats in your kitty's fur is to brush her daily, especially if she's a longhair cat. Start with a soft-bristle brush to get her used to brushing. Once she sits calmly during the procedure, remove shed hairs from the undercoat with a metal comb or undercoat rake and follow with a slicker brush. Groom all parts of your cat, from her tummy to her tail. Spend a few minutes brushing her each day to prevent having to do a larger session during the week -- plus, this prevents any mats from forming in the coat at all. Most kitties love the attention and feel of grooming, but if you have one that doesn't, use a grooming glove instead. These gloves, sold in pet supply stores, have little rubber nubs that act like a brush, but they feel to your kitty like you're petting her. In addition to daily grooming of your furball, keep her indoors or confined to a patio area. This way, her fur won't absorb dirt, grime and other sticky things, such as foxtails or other weeds, that contribute to the formation of mats. For longhair breeds such as Persians or Burmese, which have very mat-prone coats, brush them regularly; you also might want to take them in for a professional grooming occasionally. You can have some parts of their fur, such as their rear, trimmed down to prevent matting in this area. Regular grooming prevents not only mats, but also hairballs. That's good not only for your cat, but also for you. No one wants to deal with hairballs spit up on the carpet. Cat Channel: Why Does My Cat Have Mats? Cat Channel: Help! My Cat Keeps Getting Hair Mats! Is Human Shampoo Bad for Cats? Are Mats in Cat Fur Dangerous for the Cat?